Congratulations to ex-Stanley Ranger's player Max Jowitt, currently with Wakefield Trinity Wildcats who has been named in the England Youth 31-man squad. Siad coach Dave Elliott, "in 2013 boh the Academy and Youth squads will take on their French counterparts, with the Youth side also playing Wales. Stanley Rangers ARLFC - teams, coaches, committee members, parents and friends - wish you all a very Happy New Year and wish all our teams success in the forthcoming 2013 season. 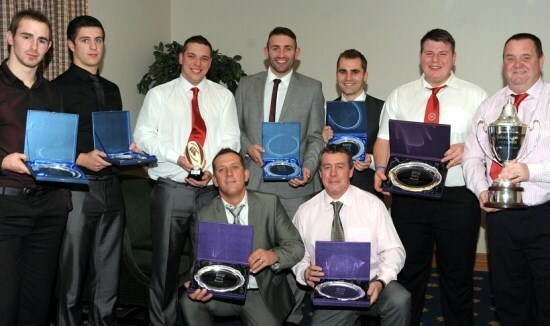 The Yorkshire Junior League presented the teams 2012 awards at the Cedar Court Hotel Wakefield on December 4th 2012. This year England's Head Coach Steve McNamara presented the awards to the players and officials on the day. Also in attendance were representatives from the RFL, Nigel Wood the Chief Executive who addressed the floor on the importance of the community game to the RFL along with David Gent, Andy Harland and David Raybould. The Cup winners from earlier on in the season were presented with their trophies before moving onto the League winners which consisted of 5 division winners. Congratulations go to two of our junior teams - the Under 13s and the Under 14s - who were both given awarded. The Under 13s were Division Two winners and the Under 14s were Division One winners. Stanley Rangers club representatives attended the NCL annual dinner at the Cedar Court hotel at Brighouse in December. Club secretary Barbara Rawlinson, webmaster Jean Reeve and guests enjoyed the dinner and award presentations. Player of the Year was awarded to Karl Dixon from Wath brow Hornets. Our junior teams have had a good run in the BARLA Yorkshire Youth Cup but have now finished their cup runs. The Under 15s playing in the Under 16s cup reached Round Three where they were beaten by Skirlaugh 16-24 and the Under 13s in the Under 14s cup run were beaten by close rivals Oulton Raiders 6-12 in Round Three. The junior teams now have a winter break as the Yorkshire Junior League has now come to an end and fixtures will resume in March 2013.